Emerging 21st century challenges require higher education institutions (HEIs) to play a key role in developing graduates and professionals, particularly in engineering and design, who can forge sustainable solutions. The trouble is there’s currently a significant lag in the preparedness of HEIs to provide the stream of professionals needed. Addressing energy efficiency competencies is one critical area. There is rapidly increasing demand from the energy industry for graduates, and particularly those adept at effecting energy efficiency gains. Hence, considering the very short timeframe available to decarbonise the energy sector, a dual approach is needed. This includes both cost effectively reducing the growing levels of energy demand (through reducing consumption and improving efficiency), while significantly increasing the level of renewable energy supply to meet this demand. We will need a portfolio of various renewable energy options and efficiency measures appropriately integrated into national grids. The good news is that engineers, designers and scientists around the world are showing that energy demand reductions of 60 to 80 per cent are both technically and economically viable, with little impact on lifestyles. This reduced demand then makes renewable energy much more manageable as a significant component of supply. These conclusions are supported by industry surveys that show low levels of awareness of energy efficiency and energy demand management opportunities in the workplace – an indicator both that organisations are largely unprepared to implement energy efficiency practices, and that they lack appropriately trained staff. It also reflects the need for better communication to organisations about these imperatives. COAG has recognised these educational needs, and has included in the National Partnership Agreement on Energy Efficiency a commitment to assist business and industry obtain the knowledge, skills and capacity to pursue cost-effective energy efficiency opportunities. However, the scale of the challenge within the higher education sector is only just beginning to be realised. Refinery engineers. Professionals across the energy and fossil fuel sectors are playing a vital role in the energy supply transformation. In 2007 the National Framework for Energy Efficiency (NFEE) funded the first survey of the state of energy efficiency education across all Australian universities teaching engineering education.9 Responses from 27 of the 32 universities teaching engineering education, in every state and territory in Australia, suggested that energy efficiency education is currently ‘highly variable’ and ‘ad hoc’ across universities and within engineering disciplines. This state of affairs is symptomatic of an institutional ‘lag’ in curriculum renewal efforts. There has been little incentive (relatively low risks and rewards) over the last 20 years to accelerate curriculum renewal towards sustainability (see graph), other than to maintain reputation and capture early student interest. However, it has become clear recently that the risk of falling behind for those HEIs that are slow to react will gradually increase due to the rising industry demand for new skills and qualifications – particularly in the areas of carbon trading and ecological taxation – and tightening government regulations and new energy related targets. There is also the significant shift in public opinion on these matters to contend with. HEIs are only just beginning to move to provide the capacity building needed, and will now have to undertake a process of ‘rapid curriculum renewal’ over the next decade to meet increasing government and societal expectations. Risk and reward scenarios for rapid curriculum renewal in the higher education sector. While the majority of HEIs struggle to address the urgency of the situation, there are significant opportunities for those who do engage in rapid curriculum renewal to create a market niche (see graph). Likewise, individuals who engage in their own professional development will be gaining knowledge skills that are still in short supply. Furthermore, as the federal government considers mechanisms for supporting this transition, there are significant opportunities for learning and teaching innovation, and applied research, within HEIs. With immanent, abrupt regulatory and market changes occurring around greenhouse gas emissions mitigation and energy supply and demand shifts, this will begin to define a new type of HEI leadership that can support the demand for such capacity building within our engineering and design professions. Cheryl Desha and Charlie Hargroves are members of the sustainability think-tank, The Natural Edge Project, hosted by Griffith University, the Australian National University and Curtin University. 1 International Energy Agency (2005) World energy outlook 2005: Middle East and North Africa insights. In: IEA projects growth in Middle East and North Africa oil and natural gas sectors through 2030, IEA Press Release, 7 November 2005. 2 IPCC (2007) Climate Change 2007: Impacts, Adaptation and Vulnerability, Contribution of Working Group II to the Fourth Assessment Report of the International Panel on Climate Change. Cambridge University Press, Cambridge. 3 Council of Australian Governments (2009) National Partnership Agreement on Energy Efficiency – Intergovernmental Agreement, p. 3, www.coag.gov.au/coag_meeting_outcomes/2009-07-02/docs/NP_energy_efficiency.pdf, accessed 12 August 2009. 4 Hatfield-Dodds S, Turner G, Schandl H and Doss T (2008) ‘Growing the green collar economy: skills and labour challenges in reducing our greenhouse emissions and national environmental footprint’. Report to the Dusseldorp Skills Forum, June 2008. CSIRO Sustainable Ecosystems, Canberra. 5 UN General Assembly (2002) ‘Proclamation of the Decade of Education of Sustainable Development (2005–2014)’, 57th Session, UN General Assembly. 6 PricewaterhouseCoopers (2008) ‘Carbon countdown: a survey of executive opinion on climate change in the countdown to a carbon economy’. PWC. 7 Proudfoot Consulting (2007) Meeting the Corporate Energy Challenge: Are Companies Walking the Talk on Energy Efficiency? Proudfoot Consulting. 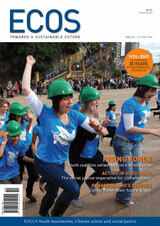 8 AIG (2007) Environmental Sustainability and Industry, Road to a Sustainable Future. AIG, Australia. 9 Desha C and Hargroves K (In press) Surveying the state of higher education in energy efficiency, in Australian engineering curriculum. Journal of Cleaner Production. 10 Desha C, Hargroves K and Reeves A (2009) ‘An investigation into the options for increasing the extent of energy efficiency knowledge and skills in engineering education’. Report to the National Framework for Energy Efficiency, The Natural Edge Project (TNEP), Australia. 11 Smith M, Hargroves K, Stasinopoulos P, Stephens R, Desha C and Hargroves S (2007) Energy Transformed: Sustainable Energy Solutions for Climate Change Mitigation. The Natural Edge Project (TNEP), Australia. www.naturaledgeproject.net/Sustainable_Energy_Solutions_Portfolio.aspx, accessed 30 August 2009.